Last night’s Superbowl may have been one for the history books – but it was the Stranger Things 2 trailer that got us the most excited. Stranger Things was just such a great show that instantly entered the zeitgeist. As soon as that 80’s era Eggo ad started playing, we knew instantly this was a promo for Stranger Things 2. While the trailer itself was a major teaser, lasting just 13 seconds (with the Bumper-Eggo ad running for 7, and the end Netflix credits the remaining 10), it did manage to include some interesting cuts. Below, we’ve taken a frame from each of the important scenes to have a close look at Stranger Things 2! PS. Halloween?! At the time of publishing this, that’s 268 days! Damn. First up, let’s watch the whole Stranger Things 2 teaser trailer. From the 80’s Eggo ad, the footage gets grainy and it cuts to a spinning Arcade sign. In the background, something is lighting up that looks a little like explosions. It really should come as no surprise that El aka Eleven returns in Stranger Things 2. Her eyes are initially closed, but a couple frames in she opens them as blood runs down her nose. Her orientation is that she’s upside down – a nod to a place she may or may not currently be after defeating the Demogorgon. The next cut is to a trailing shot of three of the boys on their bikes. It’s not immediately clear until several scenes later that they are decked out in full Ghostbusters costumes. Also, in the bike shot it appears to be only Mike, Dustin and Will. Lucas isn’t there, but in the subsequent scene. A short group of frames, that has Jim Hopper looking over his shoulder followed by an explosion of sorts. It’s more of a ‘gust’ than an explosion though, but there’s definitely shrapnel of some kind flying towards his face. In their ghostbusters uniforms, (all four boys are present in this shot) Dustin is looking out behind the camera at something with a very concerned look. Whether that’s a bully or a new monster, we don’t know. Why they are in Ghostbusters uniforms becomes more apparent in a subsequent scene, but it’s very close to Halloween in 1984. 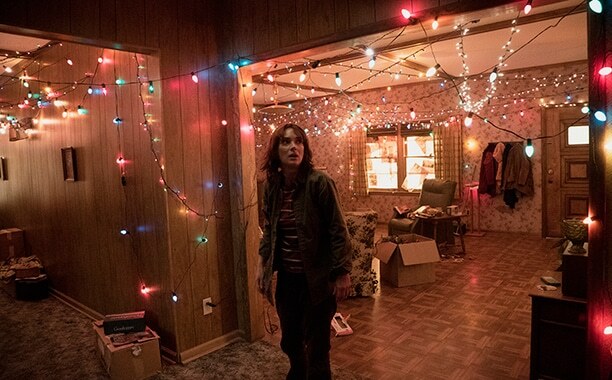 Nearly a year has passed since the events of the first season of Stranger Things. (For reference, Stranger Things took place between November 6th, 1983 and November 12th, 1983 – with a ‘wrap up’ shown on December 24th, 1983.) Also, for reference, October 30th to 31st, 1984 are Tuesday-Wednesday. This will give context to a couple images down. The one question I have is why are no other kids dressed up for Halloween? It cuts then to Jim Hopper thrusting a shovel down hard towards the ground – adds nothing. But then we get this glowing room with someone in full radiation gear, sporting a flamethrower of sorts. I’m going to wager this is a modern containment facility for the portal? Will Beyers with a Doctor? We get a two frame cut of this image, where we see Will Beyers, in a hospital gown and a brain sensor with a doctor and what looks like his mom, Joyce. The date is October 30th, 1984 (that’s a Tuesday), at 3:02PM. Why is he not in school? I mean, besides the obvious teaser at the end of Season 1. This backs out to use seeing someone watching him, as well as possibly someone on the left of the screen. There are also multiple other cameras – though they don’t seem to be a focal point. That said, we took a close look at each. The top left one has someone walking through a hallway. The one over is a hallway, beside that is a staircase, and finally, the top right tips off that it is the Hawkins National Laboratory because it’s a camera shot of the drain pipe that El went through. The bottom cameras, besides the one that Will is in are uninteresting, featuring a driveway, a closet (?) and a door. Also of note – undernearth all those TV’s are cassette tapes. A quick couple frames of what appears to be Will holding his head in frustration, and then we land on this image of a large spider-like monster. There’s no clear indication who has drawn it, but we’d wager it’s Will (again, makes sense in a couple frames.) Also on the table are a baseball, a harmonica, pencils, school work, and a Hawkins Middle School Junior Physicist Award. On the very right, there’s also another drawing with trees that look a lot like the Upside Down. The Stranger Things 2 Spider Monster? Finally, we cut to a behind the scene shot of Will at his front door (confirmed Will’s house from this image). Outside is glowing and smokey looking. The door opens by itself, and we’re given this look of something in the distance, and then it becomes far more clear a couple frames after that. This is the same creature in the drawing. Now, note that the sky has the dust like particles of the Upside Down, and they are moving. With that in mind, this COULD be a kind of flashback, akin to the one Will had in his bathroom – or it could be that he’s in there again. Stranger Things 2 comes to Netflix on Halloween. That’s October 31, 2017. Oh, what the heck – here’s a countdown timer to the release of Stranger Things 2!